Copterlab brings you the possibility to mount Up/Down mounted sensor gimbal light gimbal on your copter. These 2 or 3 axis Up/Down mounted sensor gimbal gimbals made in carbon ABS material and can use different action cameras and frame mounts. Lot of frame mounts for Up/Down mounted sensor gimbal camera have already been created however we can freely create your custom one. Up/Down mounted sensor gimbal gimbals are fully setup and ready to use, just attach it to your frame, mount your camera and power with lipo battery. 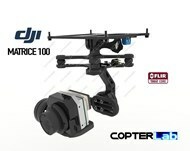 These Up/Down mounted sensor gimbal lightweight gimbals can be mounted upper or lower on your frame. You can also add a secondary battery to power this gimbal and video tx.